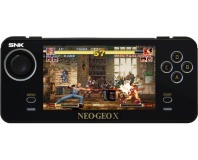 SNK has announced it will be taking the final steps to bow out of the console market, finally ceasing support for the Neo Geo line of home and arcade consoles, as well as the games and accessories. The Neo Geo was a popular arcade platform when it launched in 1990, and was also released as its fourth generation home console. The complete Neo Geo line includes the Neo Geo CD, Neo Geo CDZ, Neo Geo Pocket and Pocket Color. The home console version of the Neo Geo featured games like the Metal Slug series and the controversial Samurai Shodown and was considered a very powerful system at the time. Oddly though the home console was only available to rent at first until customers indicated a strong desire to purchase a full system. Still, with games for the home version often costing $200 each, the retail version was a major flop and was driven into cult status, especially as trends moved towards 3D graphics. SNK, which declared itself bankrupt in 2000, abandoned the hardware shortly before due to extensive amounts of piracy on the systems games. Sixteen years after its initial release, new games are still in development by some independant teams and companies such as GameTap still make emulation software for the system widely available. Collecting cartridges and extras is still a lucrative hobby for some, with games like the European verson of Kizuna Encounter fetching prices as high as $12,000 as there are only believed to be four copies in existence. SNK will cease support for the Neo Geo systems as of August 31st, citing the difficulty and cost of finding replacement parts as the main cause behind the move. Ever own a Neo Geo? What's your favourite retro game? Do you collect geek paraphenalia, or just sell everything at GameStation? Supply the answers to these, and other thrilling questions, in the forums. SNK has terminated its licence with Tommo and demanded that all Neo Geo X products be pulled from store shelves.